Lucidpress is a web-based desktop application that can be used to create brochures, flyers, newsletters, business cards, posters, magazines, and presentations. Created on October 2013 by Lucid Software, it is an alternative to complex design applications like Adobe InDesign and Microsoft Publisher and can be used to produce all sorts of designs, from single-page to multi-page documents. To some, this tool may only sound like a useful one for businesses, but it can be a very engaging learning tool for K-12 teachers, as well. If you are struggling to get students motivated to create a presentation or a brochure with other common applications, like PowerPoint and Piktochart, this tool could heighten their interest and motivate them to engage in creating informative designs. Lucidpress is also a useful tool for students that are interested in design. They learn how it’s done through cloud-based practice, templates, publishing, and collaborating in groups. Dr. Ruben Puentedura’s SAMR model offers a way to examine how technology has changed learning. As you strive to incorporate online tools into your classroom, we encourage you to use this model as an analytical tool to determine if the learning benefits of Lucidpress fit your needs. Substitution: Students use Lucidpress in place of paper/pencil presentation methods. Augmentation: Students can enhance their projects with digital media materials. Modification: Projects can be shared with other students for improvement or feedback. Redefinition: Instead of physically creating a design or presentation, students learn digital design techniques and practice different methods of creating pleasing aesthetics. Far too often, technology is used as a direct substitute for other low-tech tools (e.g., pencil and paper). While it has some benefits (e.g., students develop their technology skills), we encourage you to think about how you might use Lucidpress to modify or redefine learning in your class. Media: Distinguish the difference between print and digital forms of sharing media with tools like Lucidpress versus a newspaper, as well as the design principles and applications of each. Collaboration/Communication: Because Lucidpress allows sharing, chatting, and commenting when multiple users are working on the same project at once, this tool is great for students to practice collaborating with others and communicating to ensure the project is done on time. 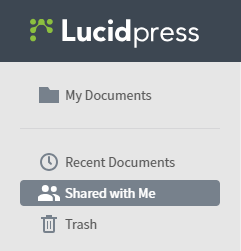 Lucidpress is also an application that is integrated with Google Drive, so projects are easily accessible and convenient to work on. Math: With the ability to create all types of media on Lucidpress, students create lessons and posts about mathematicians, math in the real world, and basic math skills tutorials, such as fractions. 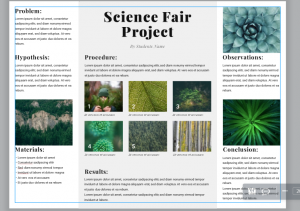 Science: Students can create science posters, brochures, and other informative science-based graphics. English: Students can create graphics to highlight grammar rules or step-by-step works cited lessons. Text, images, color links, shapes, graphics, etc. SyndiGate Media Inc. (2015). Lucidpress, Online Brochure and Poster Maker, Reaches 1 Million Users. Global Data Point. Demand Metric and Lucidpress Release Benchmark Research on Brand Consistency. (2016). Global Data Point.